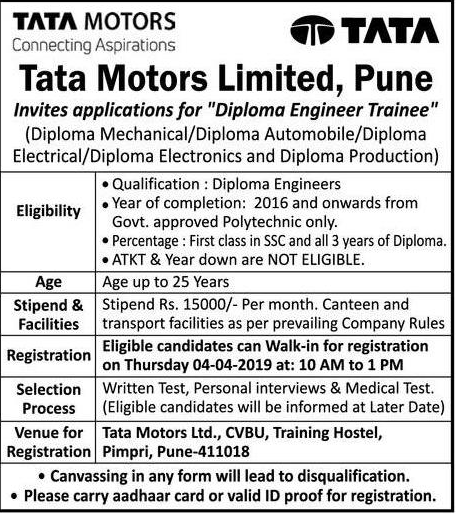 Tata Motors Pune (Tata Motors Limited), Pune published a new job notification for Diploma Trainee Posts. The willing candidates are informed to see the latest notification April 2019. Qualification required Diploma in Mechanical Engineering and More.Registration Date 04-04-2019. For More details of Tata Motors Pune Recruitment 2019 Read Below. Education Qualification: Diploma in Engineering. Interested & Eligible candidates may attend for walk in registration along with all the documents addressed at Tata Motors Ltd, CVBU, Training Hostel, Pimpri, Pune 411018.